“License and registration please.” I had been driving for almost a year and it was finally happening. I was being pulled over. My taillight needed to be replaced, the police officer informed me, and I needed to hand over my license and registration. I immediately panicked. My hands began to shake and my heart raced. I looked in the glove compartment, but I didn’t even know what the registration looked like. I pulled out a handful of papers, and with the help of the officer, found the registration. The police officer proceeded to ask me a series of questions and I suddenly burst to tears. I asked him if I was going to have my car towed, and when my uncle, the owner of the car, could pick it up. The police officer calmed me down and continued to ask for my driver’s license and then I remembered. I am a United States citizen and I have my driver’s license. I had been driving with a license for almost a year. How had I forgotten? In a very calm and stern voice the police officer assured me that I would not have my car towed. I would just need to fix the taillight and pay my ticket. He wished me a good day and drove away. I sat in my car wiped away my tears, and laughed. My parents are immigrants. They stepped onto American soil in the early spring of 1995. My mother was sixteen years old and three months pregnant. My father, a young man full of dreams and determination. They set out on the long journey to cross the border in search of a better life and future for their new family. A journey that was so long and treacherous they never returned to Mexico. Growing up, I always heard stories about their journey across the border, but never fully understood their significance. I considered my parents’ story as something normal, traditional even. I thought everyone had a story. It seemed like all the adults in my family had them, different versions of the same journey. It never occurred to me that this journey would have such profound effects on my family. It never occurred to me that twenty years later, until this very day, my parents would remain undocumented. That my parents would be deprived of rights and freedoms I would possess. Rights and freedoms they had sought out for me and which have been granted to me because they decided to cross the border to make me a United States citizen. I am privileged. I am lucky to have such brave and selfless parents. But my parents are not so lucky. My parents are shamed and ridiculed every day. They are denied these rights and freedoms despite the fact that they pay their taxes and have never committed a crime. They are denied social security numbers, pensions, financial aid, healthcare, and a simple driver’s license. These documents and papers make a world of a difference in a family of immigrants. They create a world of fear and anguish, and if families are lucky enough to someday attain immigration relief, a world of happiness and opportunity. My parents have always driven without a driver’s license. They’ve always had jobs that required them to drive to and from work and take two kids to school. Driving was a necessity; our schools and their jobs were not a walking distance away. My parents took the risk of getting pulled over every day. The sight of a police officer walking towards our car always sent shivers running down my back, and the sight of my father’s worried face always sent me into a panic. My brother and I were constantly being told to sit down, put our seatbelts on and not be afraid if the police officer came and took away our car. But we were always afraid. Afraid that on any given day we could be pulled over on our way to school or to a simple family party. Afraid that on any given week we would have to accompany our parents to court when they paid their fines. Our fears always became a reality. We were pulled over once on our way to school and had to walk the remaining two miles, once on my brother’s fourteenth birthday after a dinner celebration, and once when my dad was on his way to visit his brother in the hospital. We already knew the routine. Take all the things you will need out of the car and quietly step out. Walk towards either mom or dad and wait until they gave directions to walk to our destination. Growing up, the sight of a police car always put me on high alert and panic. A police officer meant the possibility of having our car taken away and heavy fines. I never saw police officers as protectors or “the good guys.” To me police officers were people who could not only take my car away, but also my parents. The day I got pulled over, my mind went back to those memories, to the only memories I had of a police officer. My mind automatically went into a panic and forgot the fact that unlike my parents, I had a driver’s license. I laughed when the officer wished me a good day and left. I could not believe I only had to pay a ticket and get my tail light fixed. It was too easy. I was almost happy. I knew this was wrong, I knew it was not fair. Why did my parents get treated so differently than I in the same situation? Because of a piece of paper that made them legal? No, this was not fair at all. But getting enraged about it would make no difference. I could not do anything about it. Right? There was nothing I could do for my parents when they were being pulled over. There was nothing I could do for them and their immigration status to make any of their troubles dissolve. All I could do was continue going to school, doing my best and waiting until I had a degree to help my parents financially. There was no other way to help. I did not find a way to help until I began to attend John Jay College of Criminal Justice. There I joined the John Jay Dreamers club and heard stories of students like me. Students who also had immigrant parents and sought ways to help them in any way they could. It was in this club that I first heard an undocumented student talk about his experience across the border and what it meant to him. I finally understood the meaning these stories had. In my junior year, I received the CUNY Becas Scholarship. I was required to attend a three-day retreat with the other recipients. It was one of the best weekends of my life and changed my view on immigration entirely. Almost all of the scholarship recipients were undocumented, and had stories just like the ones of my parents. All of them were great people, with long lists of accomplishments and were somehow balancing school and full time jobs. But they didn’t stop there; every one of the students had been an activist in the Mexican community. They were all undocumented, unafraid and unapologetic. This group of amazing students along with my immigrant family inspired me to look for answers and ways to help my community, to help my people. I have since decided to pursue law and become an immigration attorney. My dream is to help people like the student scholarship recipients and my parents. 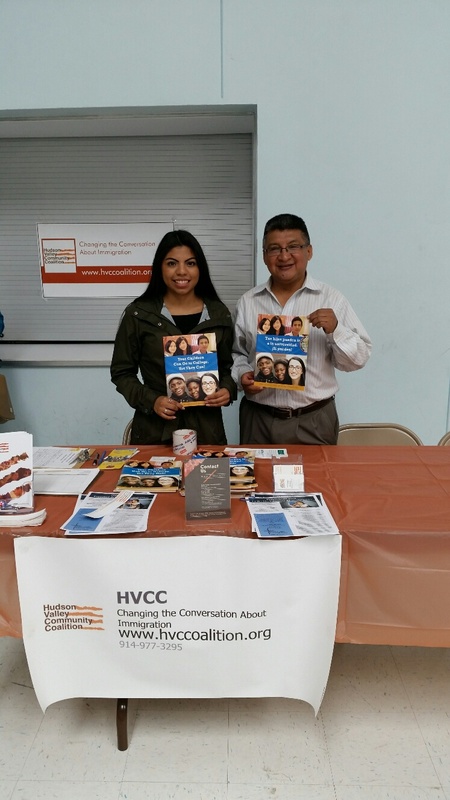 I am currently working as a Case Manager to promote DACA (Deferred Action for Childhood Arrivals) in Port Chester and throughout Westchester County with the Hudson Valley Community Coalition. I am determined to fight for my people and do everything in my power to help and support all immigrants living in the shadows. I am here to say you are not alone. I am here to say I am fighting with you. I am here to offer my help and support.